If you spend a lot of your working day at a desk then you are at risk of developing poor posture. Slumping shoulders, a hollow chest and a head that is thrust forward are all classic signs of poor posture that arise from many consecutive hours of deskwork. While some spinal curvature is normal, years of poor sitting habits and lack of exercise can lead to abnormal curvature of the spine, giving a hunched appearance known as postural kyphosis. If you think you have bad posture, don’t despair – you can improve your posture by changing the way you sit and by doing special exercises. First of all, pay attention to your workspace. Your chair should give the base of your back (lumbar) adequate support and the height should be adjusted so that your hips are slightly above your knees. 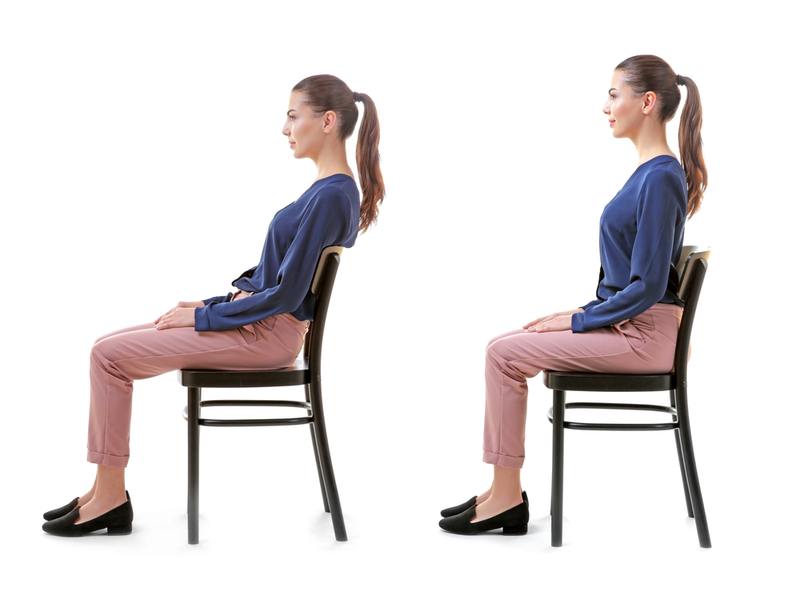 Sit with your back straight but relaxed and your shoulders back, and position your monitor so that you don’t have to crane your neck up or down to see the screen. Poor posture often causes the muscles of your upper back to become weak and loose and your chest muscles to become tight. Remedy this by holding your arms out to your side parallel with the floor and then drawing them backwards to stretch out your chest muscles for 10-30 seconds at a time. Strengthen your upper back muscles by holding your arms out in front of you and then drawing your elbows back by squeezing your shoulder blades together. Activities like yoga, Pilates and even just walking while observing good posture are all excellent ways to improve posture. If you think your posture is very poor or you are experiencing back or joint pain, visit your family doctor for advice.